If a picture is worth a thousand words, then the ladies above say it all. 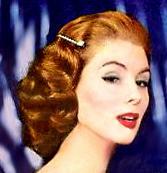 1950s fashion – hairstyles were soft and curly. Straight hair was out. Short hair was in. Young women often tied their hair back in a ponytail and circled it with a pretty chiffon scarf. But this would have been for casual activities and rarely for evening. The Fifties look was usually achieved by an arduous process of pin curling and rolling. Remember – no blow dryers in the 50s. 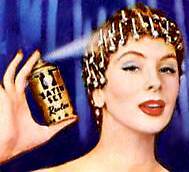 As demonstrated by super model Suzy Parker, one pinned the hair and sometimes sprayed it to keep the set. And yes, we actually slept in curlers and rollers. Don’t ask me how because I don’t remember. Denial is a wonderful thing. 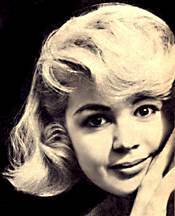 Universal-International Studios released the drawing at left so you could replicate Sandra Dee’s 1959 look, at right. All you need is several sizes of rollers, some pin curlers and the patience of Job. Even with all the curling sometimes a perm (permanent wave) was required. 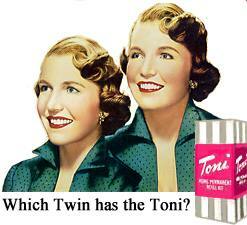 Many of us dutifully sat in the kitchen while Mom annoited our hair with the ghastly smelling solutions. And asked repeatedly, “is it time yet.” Time that is, to rinse it out! Ever ready to suffer for the cause of soft feminine looking Fifties styles, after the perm, we still had to roll, curl our hair. Why? Because the natural, unfettered curl look of today would have seemed wild and unruly back then. The poodle frenzy of the Fifties gave birth to a hairstyle – namely, the poodle cut. No better example can be found than the hair of Lucille Ball. 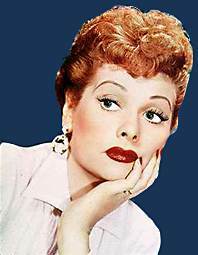 Visit the I Love Lucy pages!